Jenny Scala is a principal technical assistance consultant for AIR. 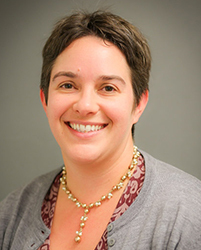 Scala is the project manager of AIR’s early warning system service line and participates in multiple projects using her expertise in using data to inform instructional decision-making. She has been providing technical assistance to educators for over 15 years. Currently, Scala is a technical assistance liaison as part of a federally funded project supporting dropout prevention practices in rural states and districts. She is the liaison to Alaska, North Dakota, and Iowa and also manages AIR’s day-to-day tasks in the project. Scala is also a researcher on the Regional Education Laboratory, Northeast and the Islands. In this project she leads workshops on early warning systems for students at-risk of dropping out of school including indicator validation, development of an early warning system tool, implementation of early warning systems, and selecting appropriate interventions for at-risk students. Scala's technical assistance experience to states, districts, and schools includes creating new strategies for supporting the implementation of early warning intervention and monitoring systems to identify and support at-risk students; supporting underperforming districts and schools; assisting states, districts, and schools to support implementation of response to intervention (especially in secondary schools); aiding states to address high school improvement; and creating statewide frameworks focused on improving adolescent literacy outcomes. She has also worked with districts to provide volunteers training aligned to district curriculum; and has provided social/emotional programs to both middle and high school students.